Jorplace i Haag, Nederland: Bestill nå! Welcome to the first and only Beach Hostel in Scheveningen Jorplace , You'll never sleep alone! Jorplace offers a wonderful experience with a laid back atmosphere. 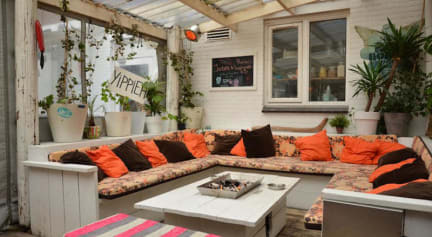 The hostel is situated at the main street in Scheveningen, just 5 minutes from the harbor and the famous Dutch surf beach. Just around the corner you can easily catch a tram to the city, Central Station and Den Haag HS station. So it is the best location in town! We offer a wide variety of different room sizes with a total of 176 beds. You can choose between the Backpackers suite 27 person dorm, a Six pack 6 person dorm, or all the way up to a private double room. We opened our doors in 2008 and are now a well known travelling hotspot for all people looking to travel on a budget. You can book a bed from €19 which includes bedlinen and lockers on the room. We offer you a hostel bar inside the surf style lounge to have some drinks & snacks , a free table football and games. Our garden has a cosy outdoor fireplace to sit at , trust us ! You will totally relax and meet your new friends. There are lots of extras that we offer: a yummy breakfast from €3,50,- ,rent a longboard from €10,-, order the Famous Jorplace BBQ from €12,50. Check-in is from 4 PM till 10 PM. Early check-in is available for €3,-. At check-in we ask a €20,- cash deposit per person and we need to charge €4,45 tourist tax p/person p/night. Bookings for more than 6 people are considered a group booking. Please use the group booking link, go to our website.